Hey, Hey...This picture above is what is coming out of my kiln these days. It's pretty much all red and green. 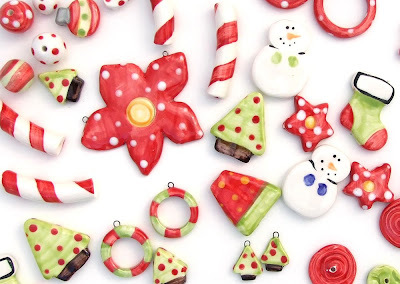 I am having lots of fun making the holiday beads and I am starting to believe Christmas is just around the corner. Where is the time going? I got some new ornaments up in my Etsy shop last night, as well as some bracelets. I plan on regularly adding gifts and beads to the store for the holidays, so you'll want to keep checking back. Well I am off to figure out what it is I need to do today.